The programme activities are directed at developing new materials, applications, technologies and products for industrial use and providing engineering services to clients. It consists of Electronics/Electrical Engineering, Mechanical Engineering, Glassblowing, Building materials, Ceramics and Industrial minerals; and textiles materials. 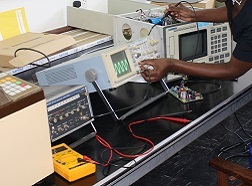 The Programme has continued to offer services in the repair and maintenance of scientific equipment to research programmes. The programme did some work on the Wind Power station to focus on the improvement of electricity generation. Scientific glassware is supplied to laboratories in the country for conducting experiments and quality control activities. Produces different ceramic products and gives advisory services on clays. Building materials and industrial minerals testing is done upon request by clients. The main objective of this project is to provide backstopping support to research and development activities at NISIR and other institutions so as to reduce on equipment down time. The project activities are repair and maintenance of various types of scientific equipment and other routine maintenance work. The overall objective is to produce and supply high quality shackle and reel insulators to institutions such as ZESCO for use in electrical installations. has not been fully exploited. 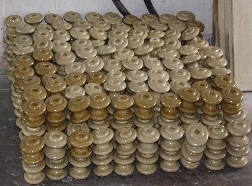 There has been a general satisfaction in importing industrial ceramic products. This has led to unnecessary loss of foreign exchange resources. 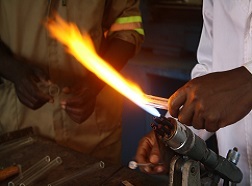 NISIR has seized on it technical capacity and its past beneficiation research knowledge of Zambian clays to begin the production of shackle and reel insulators for the local market. 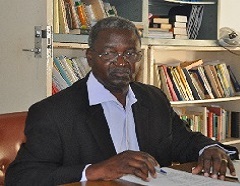 The overall objective of this project is to provide effective support to research and development activities at NISIR and other institutions so as to reduce the cost of scientific glassware procurement and promote and enhance the conduct of scientific experiments in the education sector in Zambian.